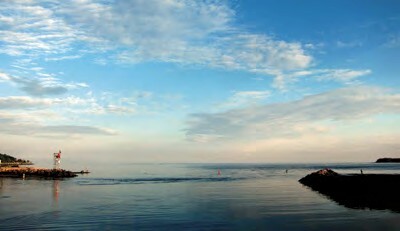 The town of Milford, Connecticut has the longest shoreline in the state and a sheltered harbor with a well-marked, wide channel. With a boating season that runs from May through November, visitors arriving from around the world find themselves in a unique location – one of the few harbors located right in the heart of a beautiful and historic downtown district. 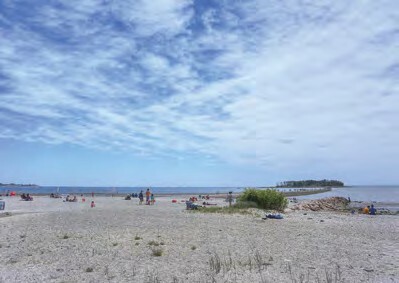 More adventuresome visitors may choose to pedal the bike trail to enjoy the beautiful vistas at the Connecticut Audubon Society’s Coastal Center at Milford Point, located on an 8.4 acre barrier beach and adjacent to the 840-acre Charles Wheeler Salt Marsh and Wildlife Management Area at the mouth of the Housatonic River. At the head of the harbor, Milford Lisman Landing Marina welcomes cruisers with transient slips for boats up to 65 feet, concierge service, shore power, pump out service, ice and water, a laundromat and showers. Lisman Landing monitors VHF channel 9 or call 203-874-1610. From Lisman Landing it’s a leisurely and short stroll to the downtown district, chock-full of friendly, independently owned shops, services, and an interesting array of dining choices. A colorful outdoor display always awaits visitors to the Canvas Patch on River Street, a gift shop owned by one of Milford’s most tenured retailers, Marti Reed. For photography buffs, there’s an excellent camera shop in town. Milford Photo, operated by co-owners Jim Wilson and Jesse Thompson, offers photo equipment, printing services, and a unique do-it-yourself digital imaging center. 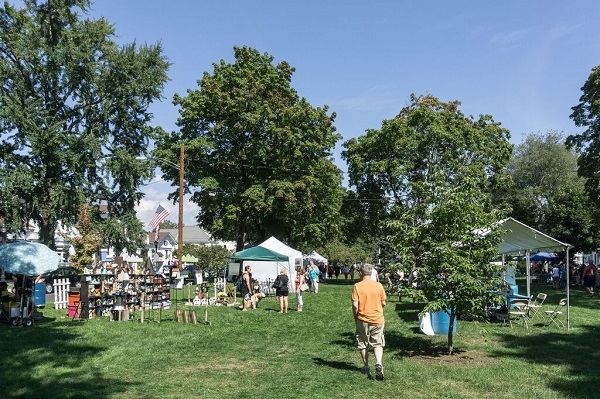 Downtown Milford is a walking feast for the eyes, with historic structures, statues, the picturesque Green – the second longest in Connecticut – and the state’s tallest flagpole. Downtown has also emerged as a restaurant mecca. Hungry patrons will find eateries for every taste and budget. Those desiring a land-and-water experience may dine at the family-run Stonebridge Restaurant or SBC Brewery, both overlooking the flowing Wepawaug River. A popular breakfast and lunch nook is The Corner Restaurant at the bottom of River Street. A quick walk from the harbor is Milford’s newest restaurant. Eli’s Tavern is a New York City-style gastropub with an eclectic menu and an array of specialty drinks and plenty of beers to choose from, too. Ray Swift, a retired Lieutenant from the Milford Police Department, now serves as General Manager at Milford Lisman Landing Marina. In the last decade of service, he’s seen visitors from around the world. “We typically host around 1,200 guests a season, a combination of overnight and hourly visitors, individuals and yacht club groups,” says Ray. “Our customers return year after year because they enjoy the proximity to downtown – it’s the best in the region for that. Visitors arriving Friday night usually make a beeline to downtown to visit the shops before they close.” He cites one visiting boater who arrived from St. Petersburg, Florida, en route to Greenwich, Connecticut. After arriving at their intended destination, they quickly returned to Milford. “They said they returned because they found that the Milford port was one of the nicest they had visited during their entire travels,” Ray shares. A short dinghy ride from Lisman Landing is the complex that houses Milford Boat Works and The Ship’s Store. Founded in 1969, this themed retail location offers an extensive array of nautical gift items and essential boating equipment. 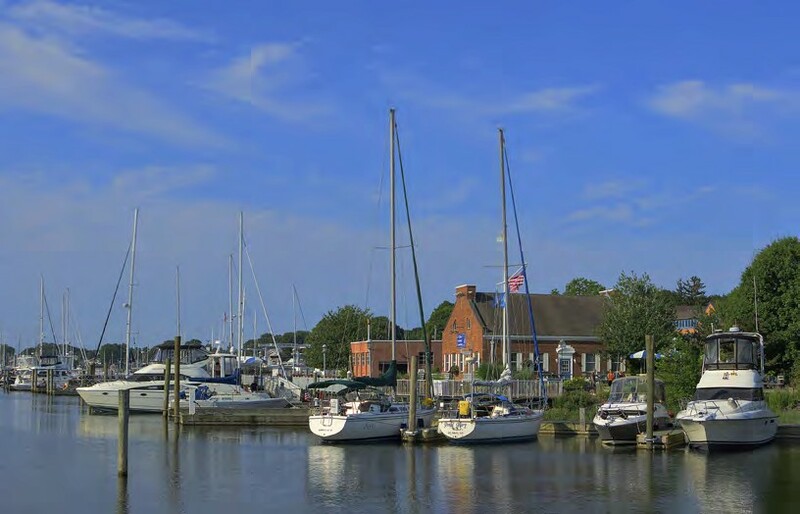 Across the street is Milford Boat Works, a family owned and operated full-service marina with a seasonal fuel dock and transient slips, this year celebrating its 70th anniversary. Milford Boat Works monitors VHF channel 68 or call 203-877-1475. Another shoreline gem is the Milford Yacht Club. With its pristine facility at Burns Point on the harbor’s west side and waterside vistas from every perspective, it’s referred to as ‘the best spot on Long Island Sound.’ Visitors will find the charm of an old fashioned boating club in concert with modern amenities including a full service restaurant, swimming pool, marina, and expansive deck that can seat 100, hosting live musical entertainment on Sunday afternoons. “While the club is not open to the general public, we are a reciprocating facility,” said Vice Commodore Ken Herbert. Day sailors will find lifts for boats up to two tons, and can launch at any tide. Milford YC is home to several regattas throughout the year, including the Optimist Regatta for junior sailors. Another upcoming event is the 8th Annual Blessing of the Fleet on Sunday, June 19, which is open to the public. Just past Milford YC as you enter the harbor is Port Milford Marina, a full-service facility with a 35-ton Travelift and transient slips. Port Milford offers expert mechanical, electrical, fiberglass and paint repairs, and they monitor VHF channel 68 or call them at 203-301-2222. On the east side of the harbor you’ll find Spencer’s Marina, which has a 25-ton Travelift and offers a range of repair services. Their phone is 203-874-4173. Cap’n Kidd Treasure Hunt/Pirates Day on Sunday, June 12 includes a colorful, family-friendly scavenger hunt and festivities throughout the downtown area. The Kick Off to Summer Blast, hosted by Lisman Landing Marina on Friday, July 1 from 4:30 – 11:30 pm, features live music, food trucks, beverages, and a fireworks extravaganza that will light up the harbor. The 42nd Annual Milford Oyster Festival kicks off with the Oyster Eve celebration at Lisman Landing and downtown shops on Friday, August 19, 2016. The Festival, on Saturday, August 20, 2016 boasts the largest variety of oysters of any festival in the USA (35,000 of them in 19 varieties from eight states on the East Coast), a canoe & kayak race, harbor cruises aboard the Schooner SoundWaters, a car show, arts & crafts vendors, non-profit organizations and much more including – for the first time in the Festival’s history – performances by two headline bands, Blue Öyster Cult and The Marshall Tucker Band. Check milfordoysterfestival.org for more details. Other 2016 downtown events include the Annual Wine Trail on Saturday, September 10, from 5 – 9 pm, Milford Restaurant Week from October 3 – 9, Hall-O-Weekend October 29 & 30, Small Business Month in November, and the Annual Lamplight Stroll on Friday, December 2 from 5 – 9 pm. Whether visiting for a day, a weekend, or longer, there’s always something happening in downtown Milford. Captain William Kidd and crew sail into Milford Harbor on Sunday, June 12. The Robert Atwood Band will perform at Lisman Landing before the Pirate Ship Oz docks at noon, when buccaneers will “take over” downtown Milford. Put on your pirate garb, practice your scurvy dog talk, and be a part of Connecticut’s best and largest scavenger hunt. Follow the clues to Treasure Stop Shops, filling booty bags with treasures galore. Those who gather stamps at all stops can enter a drawing to win a Pirate’s Chest of Treasures (one for adults; one for children). The Elwoods will perform on the Green, where there will be special pirate-themed activities for kids, including pirate-themed rock-and face-painting fun with the Rock On Girls. Have your picture taken with pirates, pirates and more pirates, and enjoy the Milford Volunteers Ancient Fife and Drum Corps outside Café Atlantique. 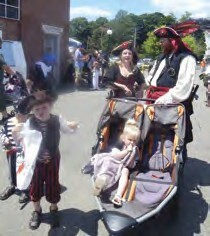 Pirates Day continues until 5 pm, when Kidd sails off to unknown lands. For more information, visit the events page at downtownmilfordct.org. A centuries-old ritual originating in southern European fishing communities, a blessing of the fleet is intended to safeguard boaters, crew, guests and vessels from the danger of the seas through a blessing given by local clergymen at the water’s edge. Milford Yacht Club proudly continues this tradition. Opening ceremonies, which are open to the public, begin at 3 pm on the club lawn. All recreational boaters and commercial fishing craft skippers are invited to join the parade of boats by staging near the MYC docks and listening for instructions on VHF channel 65. The parade starts at 4 pm and heads north up Milford Harbor. The multi-denominational clergy dockside at MYC will bless boats as they return south and head out the channel to buoy R4. 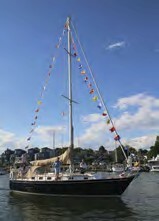 For more information, log onto milfordyachtclub.com. Milford’s Walnut Beach is the venue for the 2nd Annual Charles Island SUP CUP, presented by Scoot & Paddle (a shop on Naugatuck Avenue that rents scooters, bikes, kayaks and stand-up paddle boards) and the Connecticut Chapter of the Surfrider Foundation. The Charles Island SUP CUP is open to SUPs, kayaks, outrigger canoes and surf skis, with a 5-mile elite race, a 2.5-mile recreational race, and a .5-mile youth race. The SUP CUP coincides with International Surfing Day, and the Connecticut Chapter of the Surfrider Foundation welcomes all to a community beach party with live surf music by The Aquatudes and Commercial Interruption, MC & DJ Extraordinaire Brian Smith, Polynesian dancing with audience interaction and instruction, volleyball, Hula Hooping, yoga on the beach, free surfing, SUP and kayak demos, food trucks, sponsor tents, raffles, giveaways and more. All proceeds will go to charity. To learn more, visit scootandpaddle.com and ctsurfrider.org. Priscilla Lynn is the Executive Director of the Downtown Milford Business Association, an organization comprised of retail shops, services, restaurants and entertainment businesses committed to working together to create a strong, viable downtown. The Association presents several special events throughout the year. For more information, visit downtownmilfordct.org, email info@downtownmifordct.org, or call 203-530-0103. Great Later Model Offering Loaded With Features, Tri-Cabin Layout, Air Conditioning / Heat, Furling Mast, Electric Coachroof Winch, Bow Thruster, Shoal Keel - 5' 1", House Integrated Inverter, Twin Wheels - Spacious Cockpit, Includes Spring Launch / Commissioning!